Breakfast and Tea Cakes. Parker House Rolls. 2 quarts of flour, rub in a large spoon of butter - 1 pint of cold boiled milk, 1/2 cup of yeast, 1/2 cup sugar. Make a hole in the centre of the flour, put in the liquid and mix - let it rise over night, in the morning knead it, let it rise till noon then knead again, and make into long narrow rolls and let them rise until time to bake for tea. Steamed Brown Bread. 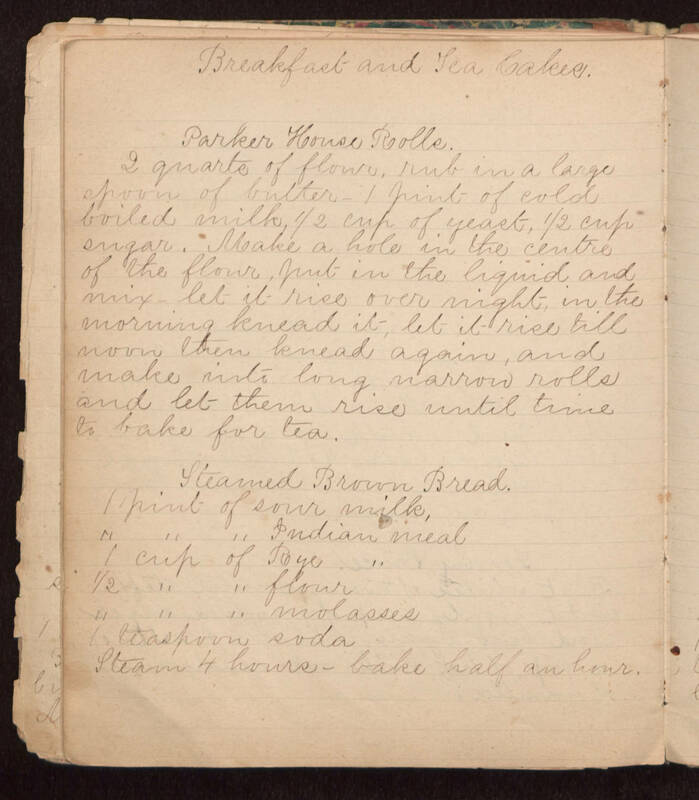 1 pint of sour milk, " " " Indian meal 1 cup of Rye " 1/2 " " flour " " " molasses 1 teaspoon soda Steam 4 hours - bake half an hour.